If you forget the password of your PDF document and you need to use it urgently, you might as well try to decrypt PDF document with the help of the application PDF Password Cracker Pro. PDF Password Cracker Pro is a professional Window utility that can help you easily unlock PDF documents. It is able to crack PDF password, including owner password which protect PDF from being copied, printed, modified, etc. and open password which protect the PDF from being opened. Please see the following contents which are about how to use this application to crack passwords for decrypted PDF documents. 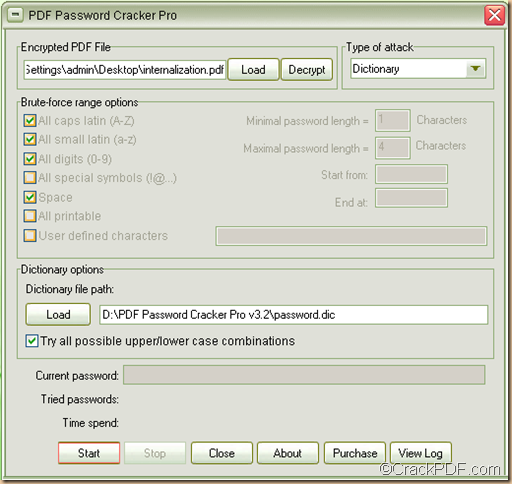 Firstly, please download the installer of PDF Password Cracker Pro. After the download, please double click the installer and follow the setup wizard to install it on your computer. Secondly, please open the software and add password protected PDF document into the application. 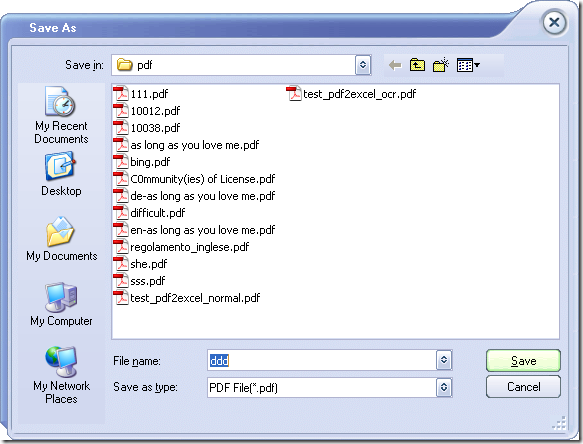 You can add the encrypted PDF file via one of the following methods. Click the Load button in the “Encrypted PDF File” panel and choose the file in the opened file picker window. Directly drag and drop the PDF document into the application. 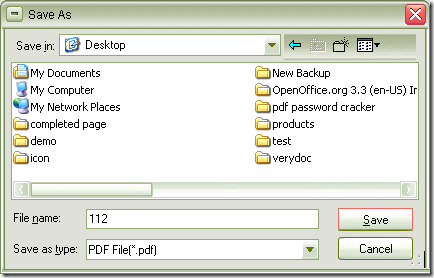 Directly input the file path of the PDF document in the input box beside the Load button. Thirdly, in the “Type of attack” drop-down list, please choose a method to crack the PDF password based on your actual situation. If you remember nothing about the forgotten PDF password, please try the “Dictionary” method which will decrypt the password protected PDF document by the dictionary in the application or on your computer. Please see it in the following snapshot. Click the Load button within this group box or input a dictionary file path in the input box beside it to load a new dictionary on your computer. Check or uncheck the radio button of “Try all possible upper/lower case combinations” to construct passwords from dictionary file automatically. Lastly, to start the decryption of the PDF password, please click the Start button at bottom of the interface. You can also click the Decrypt button beside the “Load” button to decrypt the PDF document. So, with this application, you can easily decrypt or unlock your password protected PDF document. 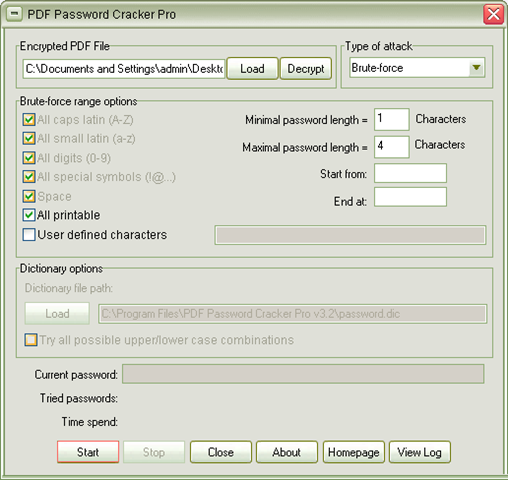 If you want to use PDF Password Cracker Pro, please download the free trial of it via clicking the following button. Have a few important password protected PDF files and want to remove these PDF passwords on Mac? 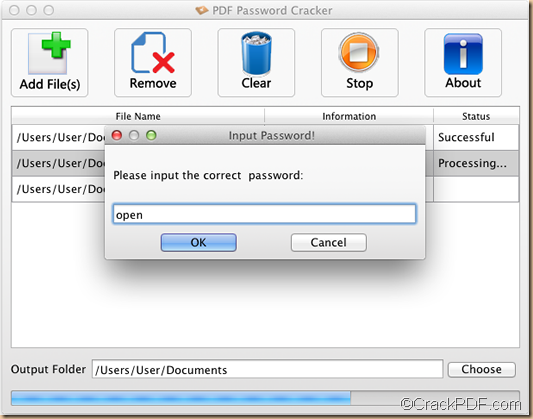 The Mac application CrackPDF PDF Password Cracker for Mac is able to help you do this kind of work professionally. A PDF file can be protected by owner password and open password. Owner password can also be called master password, which is used to protect the PDF from changing, editing, copying and printing. Open password can also be named user password, which is used to protect the PDF from opening and viewing. PDF Password Cracker for Mac is professional PDF tool that can unlock encrypted PDF files on Mac OS X v 10.5, 10.6, 10.7, etc. It is able to directly remove editing, copying, and printing restrictions from encrypted PDF documents. 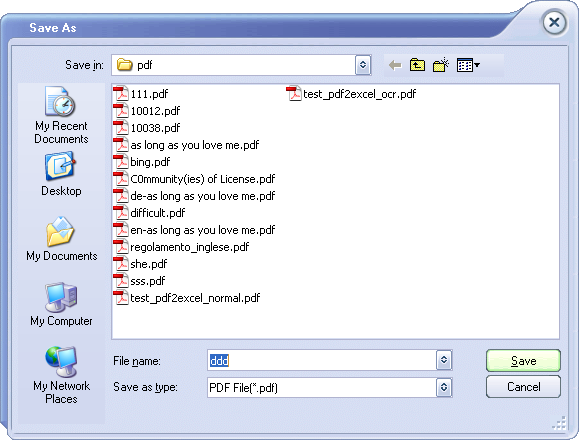 Moreover, it is capable of unlocking secured PDF documents in batch at one time. 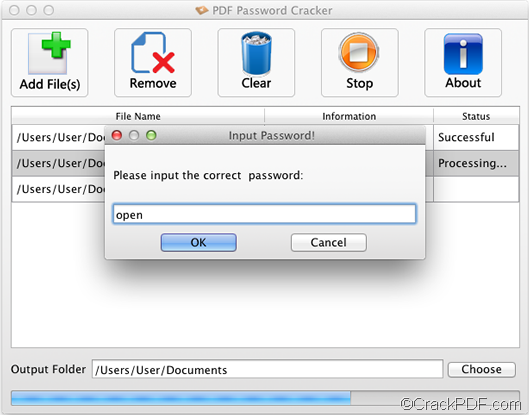 Click to download CrackPDF PDF Password Cracker for Mac, and then double click the installer to install the application. After the installation, you will see it in the Applications folder. After you launch it, please click the Add File(s) button in the tool bar on the main interface to open the file picker window. Then, please browse and choose the encrypted PDF files. If the added PDF file is protected by owner password, the application can unlock the PDF automatically and create unlocked PDF without entering the password. When encountering a PDF file encrypted by an open password, the application will prompt to require inputting the user password as shown in the following screenshot. You need to input the correct open password in the pop-up “Input Password” window and click the OK button in the window. And then the application will continue to process the current and the rest PDF files. If the PDF file is unprotected by neither owner password nor open password, the PDF file will be left unchanged. See, it is so easy to use CrackPDF PDF Password Cracker for Mac to unlock the encrypted PDF files through GUI interface! So why not have a try? Via clicking , you are able to download the free trial version. Just have a try and you will love it. How to unlock password protected PDF file? Wanna unlock password protected PDF file? PDF Password Cracker Enterprise is a professional PDF password cracker which can easily and efficiently crack PDF password, including owner password that protect PDF from being modified, copied, printed, etc, and open password that protect PDF from being opened and viewed. In the following,it will tell you how to remove PDF password step by step. Here we go. Step 1. Click here to download PDF Password Cracker Enterprise and install it on your computer. Step 2. Open PDF Password Cracker Enterprise and add password protected PDF into it by clicking Load button. You can also input the directory into the box besides Load button to add the encrypted PDF files. Step 3. Choose a type of attack from “Type of attack” drop-down box. Brute-force type is used when you remember something about the password such as the length of the password, special characters, etc. If you want to crack PDF password by dictionary, please choose Dictionary way. If you remember nothing about the password, then you can try the last way-Key search. If you choose Brute-force, you can set the following parameters. Start from: First password to be tried. End at: Last password to be tried. If you choose Dictionary, the parameter is relatively less. Dictionary file path: add a dictionary file for dictionary attack. Try all possible upper/lower case combinations: automatically construct passwords from dictionary file. Step 4. Start to remove PDF password. You can click Start or Decrypt button on the interface. Then the application will automatically try all the possible passwords to find the PDF password. For more information on how to unlock password protected PDF with PDF Password Cracker Enterprise, you can directly leave your comments below or email support@crackpdf.com. 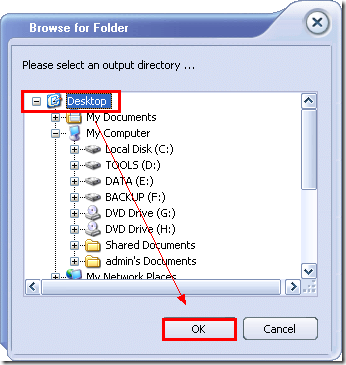 How to open password protected PDF documents? An important PDF document of yours cannot be opened because there is an open password security and the contents in it must be edited now, what will you do if you don’t remember the PDF password? 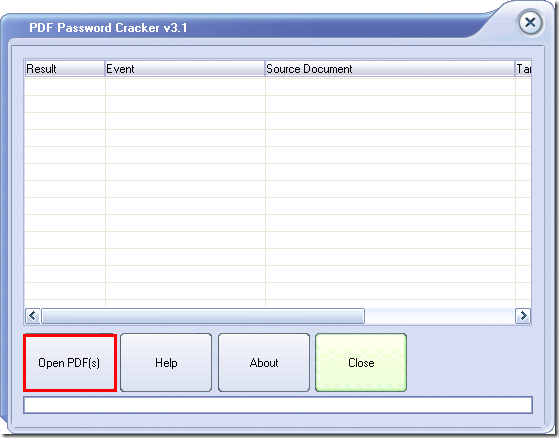 Maybe the program CrackPDF PDF Password Cracker will give you a good solution. The application PDF Password Cracker supports to remove PDF password, including open password which can be used to open PDF file and owner password which is to set restrictions for PDF document from being printed, modified, copied, etc. So to use this application, please click here to download and install it. 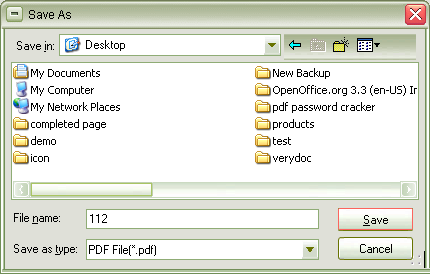 Double click the application icon, you can see the main interface of PDF Password Cracker appear on your screen like the one shown in Figure 1. You can drag and drop the encrypted PDF document into it or click Load button to add PDF document. If you can choose a suitable method to remove PDF password, the whole process will be much faster. In Type of attack group box, please choose a method from Brute-force ( The situation that you remember the length or the part of the password), Dictionary ( The situation that you want the application to remove PDF password from the dictionary file) and Key search ( The situation that you know nothing about the PDF document, with which the application will try all possible passwords from a start one). In Brute-force range options group box, you can choose to select any possible part to recover the password. You can also specify the password length by giving a max or a min length. In Dictionary options group box, you can select the dictionary file on your computer by clicking Load button. Please click Start or Decrypt button to start to remove PDF password and when the password is found, it will be shown in Current password box and you can see how much time the process spends. In addition, you need to save the password protected PDF as a normal one without password in the popup Save as window. If you are interested in PDF Password Cracker, you can purchase it on its homepage or you can contact the support team when you have any questions about the product. When you want to copy, print or modify your PDF document, you may find that your document has been protected by password and you cannot remember it. What will you do? 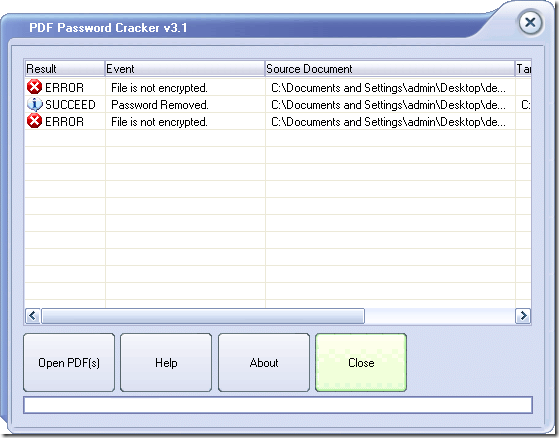 Please don’t worry, the application CrackPDF PDF Password Cracker will do you a great favor. It has the ability to recover PDF password in a second. Please download it at first and then double click the installer to install it on your computer. When open it, you can choose to open it from Start menu or just double click its icon. Please see the main window in Figure 1. It is a clear and smart application which will be easily used and mastered by you. If you want to add password protected PDF into it, please click Open File (s) and choose the document that you need. PDF Password Cracker supports to recover PDF password in batches and you can add multiple PDF documents into it one time. If you add only one PDF, then the window Save as which is for saving normal PDF without password will pop up like the one in Figure 2. You need to choose the location and input the name for the file. If you input a batch of PDF documents, the window Browse for folder will come out and it is for saving all target files. You just need to choose destination and click OK button as shown in Figure 3. Then the application will recover PDF password in a second and the information about the result will be shown in the file list of the application interface. If PDF Password Cracker remove PDF password successfully, it will show Succeed. If the input PDF is not protected by password, it will show Error information. Please see it in Figure 4. If you want to buy PDF Password Cracker, please click here where you can also learn more information about the application. If you have any questions about this program, welcome to leave messages or contact our support team. The information in Figure 1 above is the information of some password protected PDF document which is not allowed to be browsed (opened). So if you forget the password of your PDF document and you need to open it urgently, you might as well try to unlock PDF document with the help of the application CrackPDF PDF Password Cracker Pro. Click Load button to open file picker window in which you can choose the file that you need. Directly drag and drop PDF document into the application. Input PDF file path in the box beside Load button. 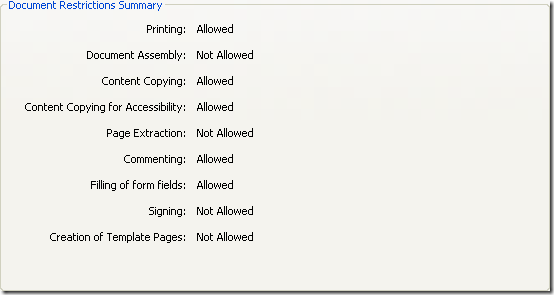 To unlock PDF document, you need to choose a right unlocking method from the application. In Type of attack group box, you can choose three ways: Brute-force, Dictionary, Keyword. When you choose Brute-force method, the options in Brute-force range options will be usable. If you choose Dictionary way, the options in Dictionary options will be available. 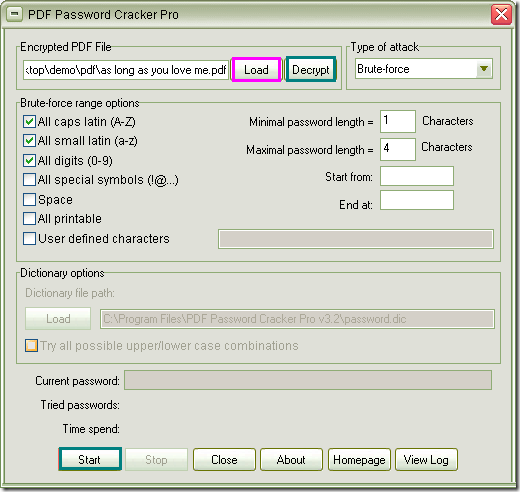 To know all the function of each option, please read the user manual of PDF Password Cracker Pro. For starting to unlock PDF document, please click Start or Decrypt button and the application will start to try any possible password of the document until the document is unlocked, when you need to save the target file without any password and then you can browse the document easily without any limitations. 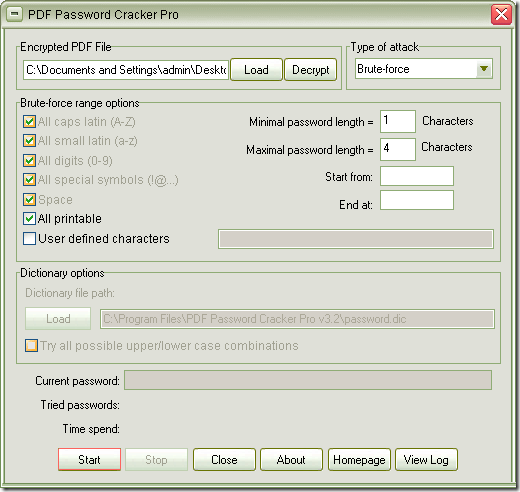 You can click here to enter the homepage of PDF Password Cracker Pro to see all of its features. If you are interested in it and need to use it, please purchase this powerful application which will be a real good helper to you. How to check Password Protected PDF file easily? Do you have the experience that you want to open a password protected PDF document but you don’t know the password or you forget it? What is pity it is. Even you remember all passwords of your PDF documents, maybe it is inconvenient to open it by typing the passwords one by one. So if you have the right, you can try to crack PDF password with a suitable application to make your work more convenient. The application you are recommended to use is named as CrackPDF PDF Password Cracker Pro which has the ability to crack PDF password, including open password which protect PDF from being opened and owner password which protect PDF from being copied, printed, modified, etc. 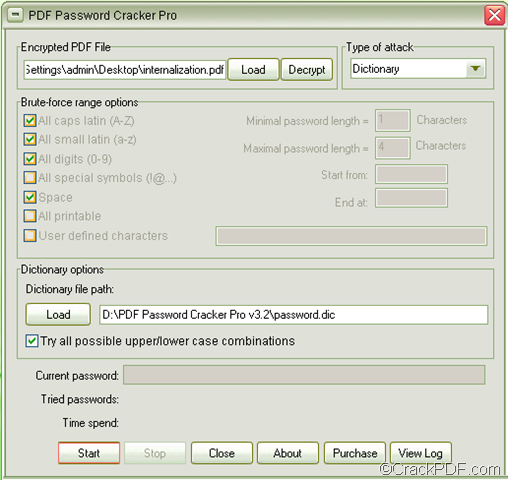 You can click here to download PDF Password Cracker Pro and install it on your computer. Please open the application and then add password protected PDF into it by clicking Load button or directly dragging and dropping. The directory of the file will appear in the box beside Load button. You can also input the directory yourself. Please see the interface in Figure 1. In Type of attack group box, you can choose any method to crack PDF password from three offers: Brute-force, Dictionary and Key search. If you know some part of the password, length of the password, etc. you are strongly recommended to choose Brute-force method. If you want to remove PDF password by the dictionary file in the application or on your computer, please choose Dictionary way. If you know nothing, you can choose the last way: Key search which may cost you a long time. The options in group boxes Brute-force range options and Dictionary options are available for Brute-force and Dictionary cracking way respectively. If you want to start to remove PDF password, please click Start or Decrypt button on the interface and the application will try all possible passwords automatically until the password is found. The window for saving the target file which is successfully removed password will pop up when the cracking process is over. Just choose the output location in Save in dropdown list, input the name for the file in File name edit box and click Save button. Please see it in Figure 2. Please click here to enter the homepage of PDF Password Cracker Pro to learn more information about it if you are interested in it. You can download the free trial version and also can purchase it.